Thinline Tele Meets Forshage Electric Guitar is complete. So let’s have a look. 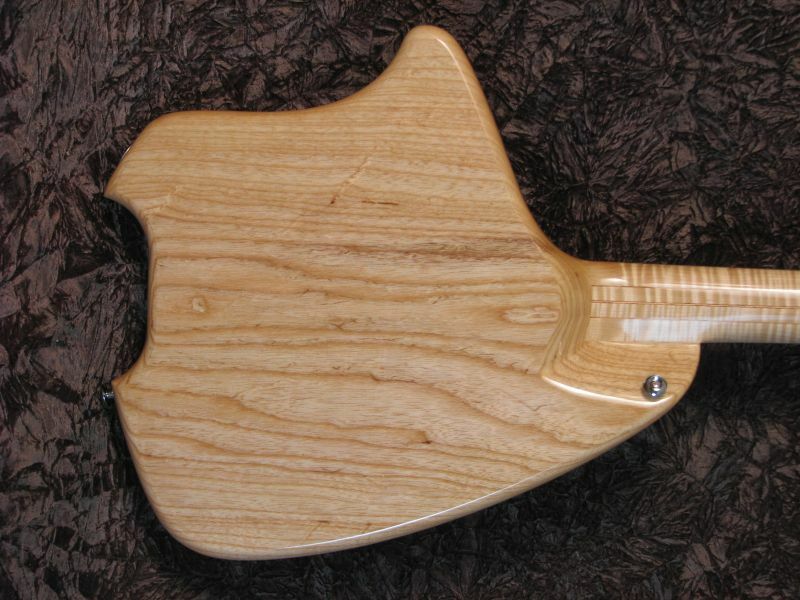 If you recall, it combines a figured ash top with swamp ash back and sides and weighs under 5 lbs. Click the picture to get a closer look. Now for the back where you can see the attention to making the neck heel unobtrusive. Go ahead – click it. A notable difference over other versions is the use of the stock ABM bridge rather than a Tune-o-matic. As Chris indicated in comments in the previous article, “it has a little more metal and sits flat on the body more like a Fender bridge”. Wow, very cool! Sound clips! Sound clips! That fretboard looks really nice (as does everything else!). Excellent job as always, Chris! especially, i love part of join between neck and body. Phenomenal. I like traditional electrics–in particular the tele. 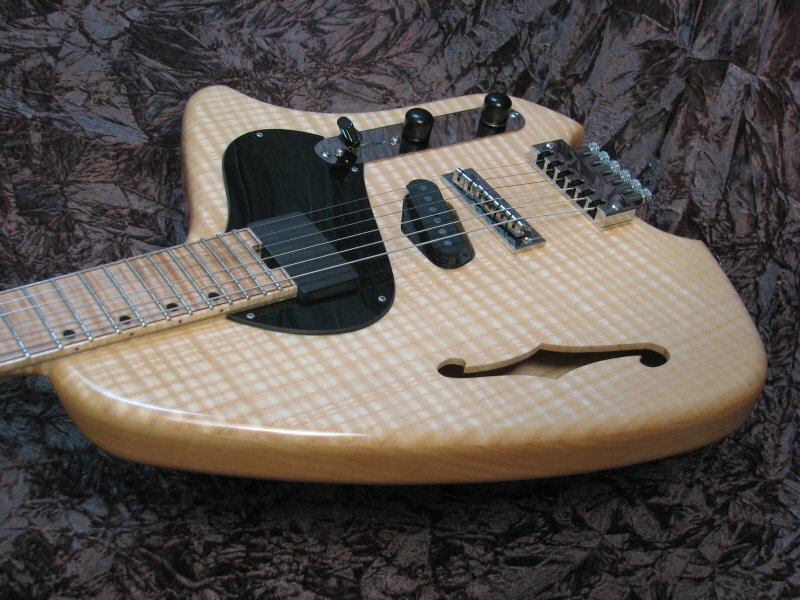 I love headless guitars of any kind, with an ergonomic design being even better. I like clear finish on blonde woods. There may be another physics explanation from Chris, but I know the comfort aspect is one of the main points. OMG, Chris ‘s done it again. What a beauty! Thanks! The extended headstock also allows for variations in nut width and traditional nut materials. I just like the way bone sounds. The telergo sounds great. The maple board is neat, complex but warm. The B-6 in the neck is jazzy and the Fralin in the bridge has all the twang and overtones that a good tele should have. All that and it weighs nothing! And under 5 pounds WOW! Makes good sense to me !! !… The only objection to my headless guitars was no headstock …?? ?hahaha Never bothered me , but some just prefer something up there..
That Tele is really Beautiful,and looks oh so Comfortable !!! 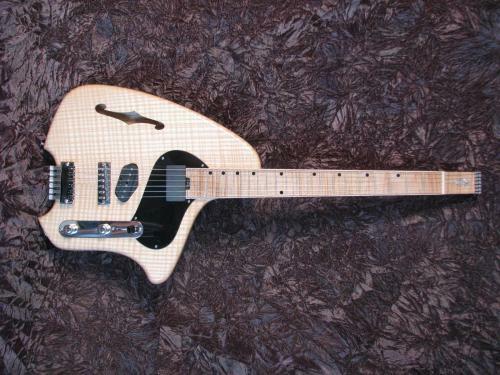 Wonder why more guitars aren’t made like this …??? That is great, I love it. Somehow it looks so much like a tele, yet is nothing like a tele. Nice work! It is so beautifully done. I love the back. It looks so natural.